The holidays are a time for gathering with friends and family in warm homes to share good food and presents. 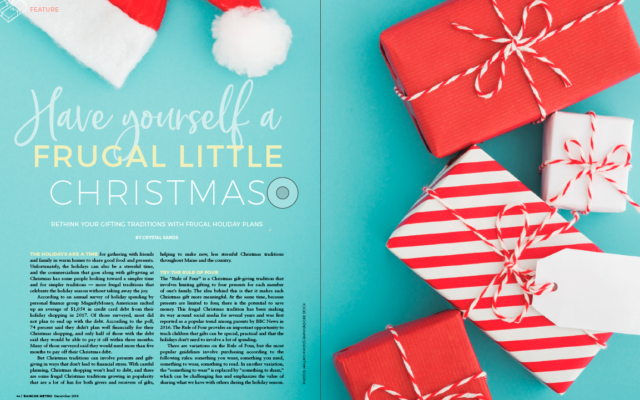 Unfortunately, the holidays can also be a stressful time, and the commercialism that goes along with gift-giving at Christmas has some people looking toward a simpler time and for simpler traditions — more frugal traditions that celebrate the holiday season without taking away the joy. According to an annual survey of holiday spending by personal finance group MagnifyMoney, Americans racked up an average of $1,054 in credit card debt from their holiday shopping in 2017. Of those surveyed, most did not plan to end up with the debt. According to the poll, 74 percent said they didn’t plan well financially for their Christmas shopping, and only half of those with the debt said they would be able to pay it off within three months. Many of those surveyed said they would need more than five months to pay off their Christmas debt. To read this article in full, pick up the December issue of Bangor Metro available now! Click here for a full list of where to find Bangor Metro on newsstands or better yet – click here to subscribe and get Bangor Metro delivered to your door!